Consumers who are seriously in the home-buying and -selling market should be mindful of a variety of competing home price estimators. Solely relying on just one price estimate is likely to skew the views of what a particular property will actually transact for. When it comes to online home value estimates, however, the No. 1 caveat for consumers is that these estimates are not a substitute for formal appraisals, comparative market analyses and the in-depth expertise of real estate professionals. Nonetheless, it is important to know the different sources of automated valuation models (or AVMs) and home value estimates available online, so that you can help clients and potential clients understand these estimates in their proper context. How are online home value estimates created? The prevalence of technology offers more access to a broad spectrum of information on the internet. In real estate, access to property details and values is easier due partly to low-cost immense computing power. AVMs generate a price for a property based on computer algorithms and calculations that take different sets of property data and look for patterns and relationships between property value and the input data. There are websites that will have a home value estimate available by just searching an address, while others may provide an estimate only upon request. Realtors Property Resource® (RPR®) – RPR® has two home value estimates: their AVM estimate and the Realtors Valuation Model® (RVM®) estimate. The difference between the two is that RVM uses the same data as the AVM plus Multiple Listing Service (MLS) data. Both AVM and RVM show the accuracy level of the estimate by giving estimate ranges and confidence scores. This resource is available for REALTORS® only and allows a significant amount of expert customization, making it a useful tool for members, especially when working with well-researched clients. realtor.com® – Realtor.com uses tax assessment records, recent sale prices of comparable properties and other factors to estimate home values. This estimate is free and publicly available. Redfin – Redfin is a web-based real estate brokerage that gives the Redfin estimate for the property, which is based on market, neighborhood and home-specific data, including MLS data on recently sold homes. Redfin cites that their estimates for properties currently on the market are more accurate than estimates for off-market properties. This estimate is free and publicly available. HouseCanary – HouseCanary has two main services: valuations and forecasting. Their estimates use property-level data from public records and the MLS. Their accuracy will vary across markets depending on the availability of data. This estimate is available with subscription to their services. Homes.com – Homes.com’s estimate mainly uses public records. They test and benchmark the accuracy of their estimates. This estimate is free and publicly available. Zillow and Trulia – Zillow has the Zestimate, which is their home value estimate for properties and is computed using public and user-submitted data. Their estimates have different accuracy levels depending on the data of the property and location. This estimate is free and publicly available. The estimate from Trulia is likely to be very similar to Zillow’s Zestimate, since it is part of the same Zillow Group. Eppraisal.com – Eppraisal.com uses property records, home sales data and local market data for their estimates. Their accuracy depends on the accuracy and completeness of public data. This estimate is free and publicly available. There are also websites that provide home value estimates by request only, or estimates using user inputs, such as HomeValues.com, SmartAlto.com, ValuemyHouse.com and ZipRealty.com, among others. Some banking and financial institutions, such as Chase Bank, Bank of America, the Federal Housing Finance Agency, Fifth Third Bank and PennyMac, also provide estimates to accompany their other financial services. Some real estate agents and brokerages also share their estimators through their websites. Again, it is important to know that these estimates have varying levels of accuracies. These sites may or may not use AVMs, but can be another source of property and home value data that anyone can access. Additionally, there are also data companies, such as ATTOM Data Solutions and CoreLogic, that market proprietary AVMs. As technologies advance and more data becomes available, the number of sites that provide home value estimates may grow. With the knowledge of where to find home value estimates online, it is important to note that these home value estimates are not interchangeable with formal appraisals and comparative market analyses, and they cannot be used as a basis for a loan. Most of these sites, if not all, reiterate the importance of consulting the expertise of real estate professionals to receive an in-depth and in-person analysis of the property and the local market. This article was adapted from a post on NAR’s Economists’ Outlook blog on July 3, 2018. Karen Belita, data scientist, focuses her research on discovering insights using large publicly available datasets. Belita has a Bachelor’s degree in Finance from George Mason University and a Certificate in Data Science from Georgetown University. For more education about comps, valuation and pricing strategy, check out this month’s featured online certification course at the Center for REALTOR® Development, Pricing Strategies: Mastering the CMA, which is the educational requirement for NAR’s Pricing Strategy Advisor (PSA) certification, and is on sale this entire month of July at 25% off its regular price. In addition, Episode 001: Pricing Strategies in the Market, of the Center for REALTOR® Development’s monthly podcast, discusses pricing and valuation and is available for free on most podcast channels. To listen or subscribe, visit www.crdpodcast.com. The post A Closer Look at Online Home Value Estimates appeared first on RISMedia. 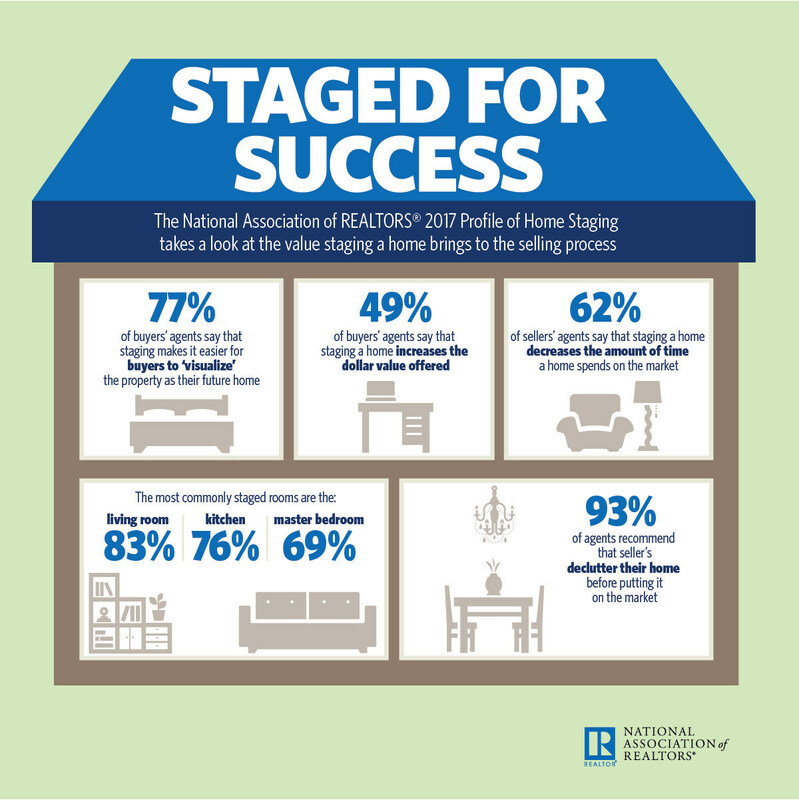 The post Ask the Expert: How Can Staging Pave the Way for a Better Sell? appeared first on RISMedia. The post REALTORS®: Home Staging Cuts Time on Market appeared first on RISMedia.